On Saturday, Child Two and I went to the annual rummage sale held by the seniors’ center. It’s so big that it can’t be held at the seniors’ center itself, so they have it at a nearby hockey rink. It’s so busy it’s crazy. We got there about 10 or 15 minutes before it opened and found the end of the line about two blocks away. By the time we started moving, there were as many people behind us as there were in front of us. As we stood at the top of the ramp into the arena, we couldn’t even see the tables. It was just a sea of heads. Don’t bring a purse. It’s just something for people to bump into. Bring only what you can carry in your pocket. No matter how far away you have to park and no matter how bad the weather, don’t wear a big coat or bring an umbrella. Have a set meeting spot in case we get separated by those crazed bargain hunters. If you’re interested in something, pick it up while you’re thinking about it or it might disappear right from under your nose. People tend to lose all sense of perspective and etiquette in these situations. Expect to be stepped on, bumped into, walked in front of, and pushed out of the way. Last year we didn’t buy much, but this year we had to take a trip to the car to unload halfway through. We were looking for tapestry yarn, but the two ragged bags they had were priced at $5 and $10, and since we couldn’t really see what was in them—they looked like tangled messes from the outside—we passed. 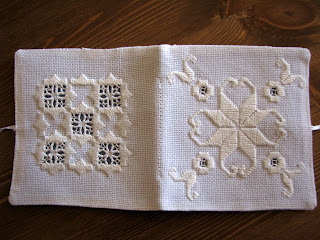 I also found a hardanger needlebook for a nickel (a nickel!). 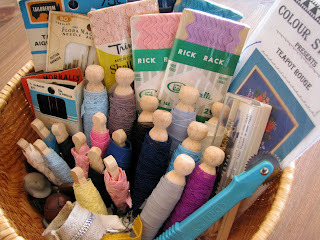 This was serendipity, as I’ve been wanting to make some needlebooks lately. 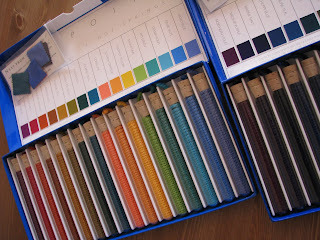 And there were these odd boxes, containing samples of thick yarn and little fabric swatches. The only thing we can think they might be is some kind of sales display. I have no idea what I’ll do with them, but they were too odd to leave behind. An old manual typewriter. 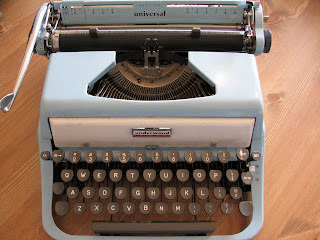 A blue old manual typewriter! A blue old manual typewriter for $2! We were so thrilled about it that I didn’t even mind schlepping it four blocks to the car, two of them uphill. My mom worked at the sale, and after Child Two and I went home for lunch, I decided to go back in case she was tired and/or frazzled and needed a ride home. My good deed was rewarded. Getting there five minutes before they closed, I went for a last look at the craft tables and discovered some last-minute deals. The ladies sold me a bag for $1 and told me to stuff it with as much fabric as I could. They were so excited to be almost done that they helped me, and I wasn’t sure just what fabric was in there until I got home. 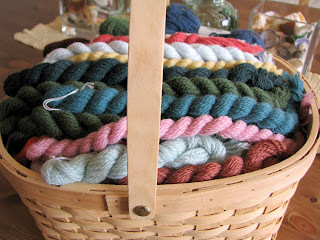 And remember the bags of tapestry yarn? Well, they gave them both to me for $5. 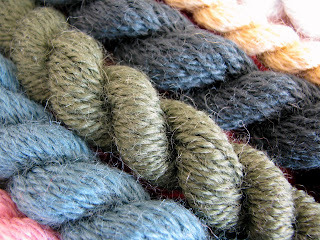 When I got home I found a rainbow in those bags—some of it cut into working lengths, many partially used skeins, several untouched skeins, and all of it wool. As I sorted it out, it was clear that both bags had belonged to the same person, and I wondered about her. Maybe she was a woman like my oma or my great-aunt. Maybe, like Oma, she got Alzheimer’s and could no longer do her crafts. 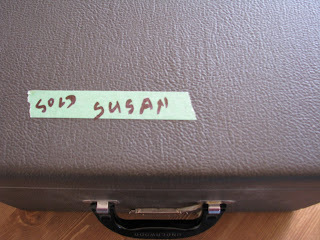 Or maybe, like Tante Bep, she passed away, leaving behind this treasure in wool. In any case, it’s gone to a good home. LOL I looked at those 5 pointers and I can use them all for our dear sons' upcoming spring carnival- AKA candy day from he!!. Although I will substitute candy hunters for bargain hunters. Loving that typewriter. Are you going to put in your office? It is gorgoeus, as is all that yarn. Glad you all had a great day! Amazing finds. There will be a rummage sale in my neighborhood this weekend and after seeing your post I'm very motivated to go on my own treasure hunt. That is an awesome sale. What fun finds. thanks for the gardening advice. It was the best I heard. it must be just because English is a foreign language for me, but I've had some difficulty in understanding your blogs lately ;-) First you write "Enough garbage, already!" 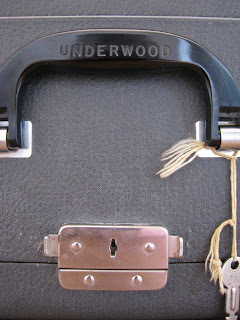 and then you go to a rummage sale! LOL I thought rummage is quite the same thing as garbage. But the pictures tell more than words. What you bought are real treasures. Have a nice day! And a nice weekend! You're right--a lot of stuff at rummage sales is garbage. Actually, we've learned a sixth thing, which I forgot to put in my list: Buy something only if you really want or need it and know you will use it, or you'll be donating it back to the rummage sale next year. At this sale, I was tempted by many other things but I didn't buy them because I knew that within days I'd be wondering "What was I thinking? This is garbage!" I work at a senior center and it is amazing what people donate to us. We love having these sales.